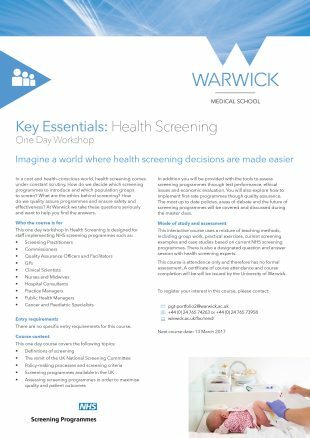 The University of Warwick is again offering a one day workshop in health screening aimed at any staff involved in the provision of NHS screening programmes. This follows positive evaluation of the first such study day held last year. Warwick Medical School is set to run the workshop annually to complement its existing week-long health screening module. During the one day workshop, delegates explore how we decide to introduce a new screening programme, the ethics and economics of screening and the quality assurance of programmes. In addition, they discuss current policies, controversial areas and the future direction of screening programmes in England. The workshop is suitable for any staff involved in providing NHS screening programmes, including screening technicians, commissioners, quality assurance and failsafe staff, GPs, midwives, public health managers and practice managers. To register your interest in the workshop, please email , telephone 02476 574263 or visit the University of Warwick website. The week-long module, which usually runs in November, is available as a postgraduate award, a non-accredited CPD course or as part of the Masters in Public Health programme. PHE funds a few places on the module every year for NHS staff. For details of the application process see the Screening CPD website. The PHE Screening BLOG provides up to date news from all NHS Screening programmes – replacing our previously published newsletters.